To prepare for the 50th anniversary of the foundation of the parish, much work was done to enhance the church. The sacristy was enlarged in 1936. The interior of the church was redecorated and a new entrance was added on DeWald Street, near Our Lady’s Altar. Two new side altars were acquired from the Daprato Company in Italy and installed in time for the jubilee celebration. The altars are constructed of four varieties of Carrara marble. A new heating plant was also installed at this time. The church was later redecorated at the time of the diamond jubilee in 1965. 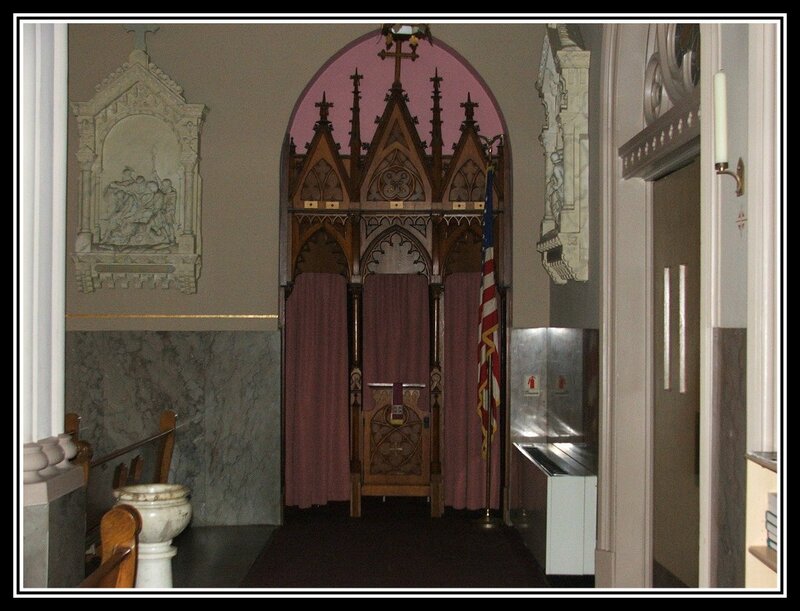 Of special note are the two old confessionals that still remain near the front entrance of the church. The beautiful wood carvings depict the keys of Saint Peter. The Gospel of Saint Matthew remarks that Jesus entrusted to Saint Peter “the keys of the kingdom of heaven” (Mt. 16:19). Because of the secrecy involved in confessional matters, one entrusts his or her sins to the power of the keys with the assurance that the sins will never be disclosed.